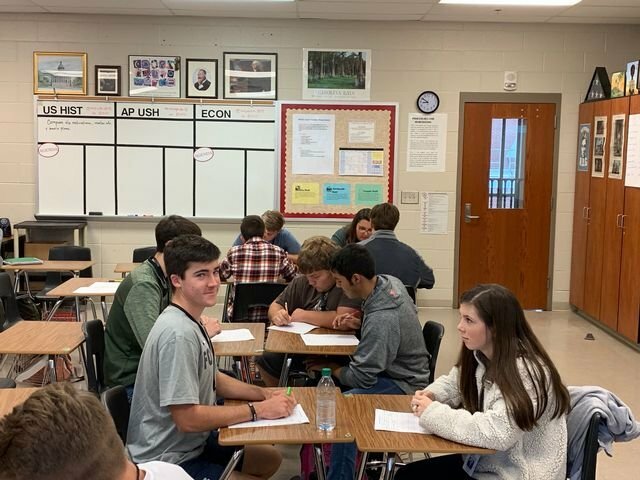 Students in Mr. Hook's AP U.S. History class participated in an assignment where they took on the role of an 18th century social reformer (Frederick Douglass, Susan B. Anthony, Ralph Waldo Emerson, etc.) and participated in a speed dating scenario. The goal was for individuals to find their perfect "match" in the form of people they could relate to who had the same political, social, or economic interests or ideals during that time period. Students brought props to go along with the characters and enjoyed the soft sounds of popular love songs that set the "mood." Students did a great job of preparing their characters/roles and asking insightful questions as they got to know each individual in only 3 minutes.